The first Japanese student to graduate from the University of Pennsylvania appears to have been Tosui Imadate, who graduated with a Bachelor of Science in 1879. The first Japanese student to have graduated from the Medical School seems to be Osam Nagura, who graduated with a Medical Degree in 1880. 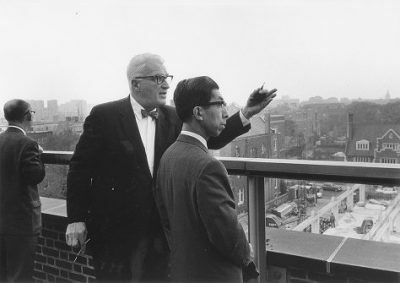 The Japanese alumni from Penn seem to have been quite active in the first half of the twentieth century: for example, Sadijiro Suguira established “The Same Window Society,” the first Penn alumni association, in Japan in 1903. Also, the Japan Students’ Club was active as early as 1928. 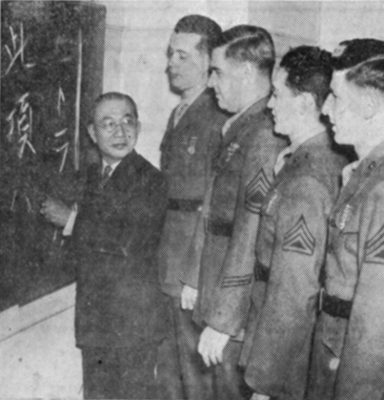 But it is easier to mark trends and patterns in Penn’s relations with Japan during and after World War II. In 1942, Sannosuke Yamamoto, a Japanese man whose daughter attended the Penn campus, began to teach the language of Nippon to men in the military at the University of Pennsylvania (pictured below). Of course, it must be understood that Yamamoto had been in the United States since 1905. In 1965, the University of Pennsylvania was visited by members of the Japanese royal family. Prince Mikasa, Princess Mikasa and their daughter, the Princess, attended a luncheon and toured the campus. Prince Mikasa was the youngest brother of Emperor Hirohito. 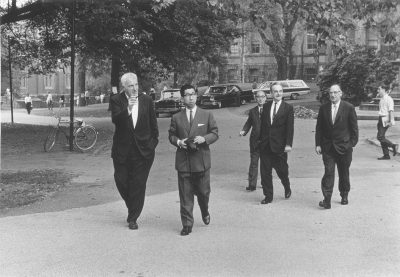 The royal entourage, composed of ten individuals, were greeted by Penn President Gaylord P. Harnwell. The Prince (pictured below with Harnwell), who was a student of Near East history went to see that collection at the University Museum and spoke with other Japanese countrymen in the Oriental studies section in the library. 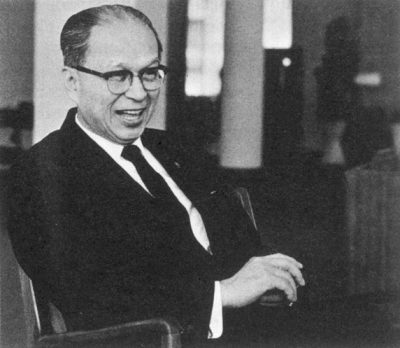 In 1968, the Department of Oriental Studies was aided in its East Asia Division by the efforts of Dr. Saburo Kitamura in Japan, who had graduated in the College class of 1930 and the Medical School in 1936. Kitamura helped develop a book fund whereby the University Library would receive more texts in Japanese. He explained that the year was a good one to develop such a program as it was the 100th anniversary celebrating the Meiji Emperor opening Japan’s doors to the West. As Western knowledge had poured in one hundred years prior to Japan, it was only right that Japanese knowledge would flow into America as well. That knowledge flowed into the University of Pennsylvania. At the time, Penn offered courses in Japanese “medieval prose and drama… [as well as] the linguistic approach to the study of [Japanese] history and structure of the [Japanese] language.” It was one of the only institutions to do so. The book fund would aid this work as well. Kitamura’s story is an interesting one in and of itself. After graduating from Penn, he went home in 1940, only intending to be there for a short visit. It would last twenty-five years. After having worked in a Tokyo hospital in 1942 as the only doctor on site, he was found after the war by Penn professor Eugene P. Pendergrass. Through Pendergrass’ efforts, Kitamura (pictured below) became the head of the Atomic Bomb Casualty Commission, an organization designed for the treatment of victims of the Atomic bomb. After spending some time in Hiroshima, he returned to Tokyo where he opened the Kitamura Diagnostic Clinic. In May 1983, with the aid of two grants, the Institute of Medieval Japanese Studies was enabled to purchase materials that would aid in scholars using the slide and microfilm archives therein. The Institute had been established in 1968, financed by grants from both the University of Pennsylvania and the National Endowment for the Humanities (NEH). As of 1983, it was the only one of its kind outside of Japan. The materials being purchased in the 1980s would also aid in the analysis of reference materials that the Institute had acquired through Dr. Barbara Ruch, while she was in Dublin, Ireland. What she had acquired were the “only such materials in the world.” The grants for the research materials, which included a purchase of a five-hundred volume set of reference works, were donated by the Japan World Exposition Commemorative Fund and the Japan Foundation. That same spring, a new United States-Japan Center was created at Penn as “the first university-based research operation to develop data on the Japanese economy and its interaction with the U.S. economy.” For eight weeks that summer, a Japanese delegation composed entirely of executives stayed at the Wharton School studying American management techniques. 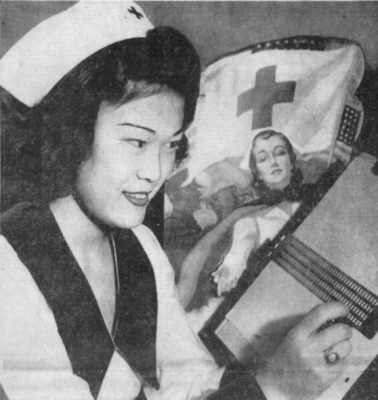 The Center was financed by the efforts of both American and Japanese companies.